This is my first ATC, and I had fun making it. Thanks for giving out this challenge! I used a blank ATC by Strathmore and applied Adirondack alcohol ink “stream” for the background. 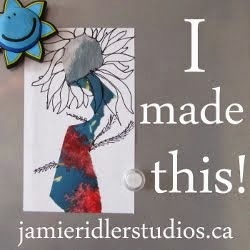 I embossed the bottom circle swirls with an emboss tool from EK Success. I highlighted the embossing with Decorating Chalk from Craf-T Products. 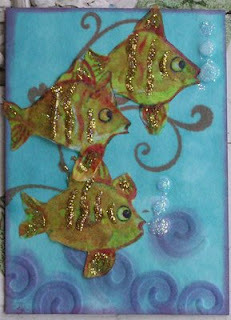 The fish were from some tissue paper scraps I had and the glitters were champagne and diamond Stickles from Ranger. So great that you joined us at Art Pieces. Hope to see you again soon with more beautiful ATC`s. Oh, I love the fishes!!! And the background was great as well! Thank you for joining us at Art PIeces! Really lovely fish-ATC!! Great work! !